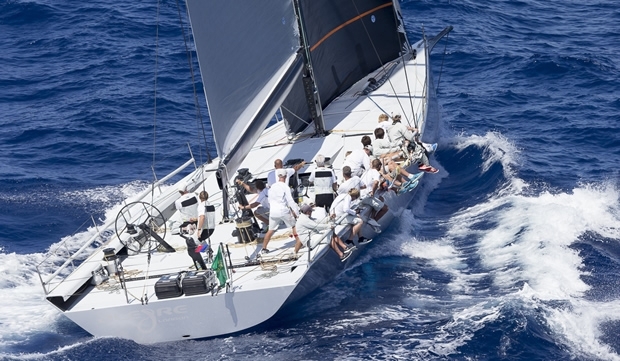 The 25th Maxi Yacht Rolex Cup set sail today with a coastal course that wound through the islands of the La Maddalena archipelago covering more than 30 miles in choppy seas. Leaders in their respective divisions at the conclusion of Day One are Alegre (Mini Maxi), Ranger (J Class), J One (Wally), Highland Fling (Maxi), Firefly (Supermaxi), Lupa of London (Mini Maxi Racing/Cruising). Following a two hour postponement as the Race Committee waited for the 35 knot Mistral that had blown overnight to abate, the first starting signal sounded at 13.00 and the fleet set off north to round Monaci island in 8-10 knots of northerly breeze. The Mini Maxi and Wally fleets then rounded the Barettinelli islands at the top of the archipelago while the remainder of the fleet cut inside to round the top of the main La Maddalena island sailing a slightly shorter course. In the Mini Maxi fleet, racing for its World Championship, Alegre got off to a good start, had taken the lead from Niklas Zennström's Rán 5 at the windward mark and quickly extended over the rest of the fleet. Alegre dominated to the finish and maintained her lead in corrected time over Hap Fauth's Bella Mente in second and current world champion Rán 5 in third. Alegre's owner Andres Soriano commented: "It's only the first race of what I am sure will be a highly competitive series, but I was delighted how well the boat performed today. The wind forecast showed 20 knots or more, so we went with the smaller main and to get to the top mark first was an excellent performance. In this fleet, getting there first is always a top priority. Rán and Robertissima were just behind us, but got into a one-on-one, and had to tack to make the turn. However, the fleet came back at us on the run back and that is always expected with this quality of competition." After three and a half hours and more than 36 miles of close, coastal racing only five seconds separated the first and second J Class yachts, but both the victors Ranger and the first J to break the Yacht Club Costa Smeralda finish line today, Rainbow, had good reason to be delighted with their best race successes this season. Ranger handed back a race win in Palma in June when they took an arbitration penalty after finishing, but today they were justly rewarded. They showed their guile in the lighter, shifty conditions on a beat up the west side of La Maddalena. Working more offshore they stayed with better wind pressure and sailed round both Lionheart and longtime race leader Velsheda which struggled in lighter air close to the island. Ranger went from fourth to lead, only narrowly losing out to Rainbow when she went head to head around the top of the Barrettinelli islands. Rainbow eked out a small lead on the final long reach to the finish line, but Ranger – the older, heavier boat – corrected out as winner. Ironically on the key windward leg up the west side of La Maddalena it was as light as seven or eight knots with a noticeable split between the old gradient and new local breeze which Ranger’s tactician Murray Jones read well. After choosing the favoured, right side of the first windward leg Velsheda came back from a lacklustre start to lead around the first mark by nearly one minute from Rainbow with Lionheart and Ranger paying both paying a price for going left, rounding third and fourth. Velsheda, with Hamish Pepper as strategist supporting tactician Tom Dodson and Ed Smyth as navigator, showed good pace on the run and reach but found themselves with a typical leader’s dilemma, as they moved first into the lighter pressure. They had to choose to try and cover the advancing Rainbow and Lionheart which were working the Maddalena shore or to stay out with Ranger. Velsheda just erred too close to the land and could do nothing as their lead evaporated, slowed for a couple of minutes in much lighter pressure. Lionheart lost here too. From challenging for the lead the crew which have won the first two regattas of the season – made one expensive tack back to the shore and dropped to fourth. “I broke some of the owner’s rules today,” commented Murray Jones, “Don’t get in a tacking battle – and we did – but it was a tough situation. We realised anything could happen there, round the back of the island, we managed to break out of phase with Lionheart who were tacking on us every time. We did a couple of shorter tacks and then felt there was more breeze on the outside and that paid for us. We snuck around. We might just have been able to cross Rainbow but the breeze was changing all the time, it came in quite quick again. We went round the top just behind them and then knew we had to stay really close to try to beat them on corrected time. Among the Supermaxis the Dutch crew on Firefly took first place in corrected time ahead of the 33-metre sloop Inoui with Vittorio Moretti third place on Viriella. Sir Lindsay Owen-Jones' WallyCento Magic Carpet 3 stormed around the course well ahead of the remainder of the Wally division but slipped back to second place in corrected time to her predecessor, Jean-Charles Decaux's J One. In the six boat Mini Maxi Racing/Cruising division, Jeremy Pilkington's Lupa of London started well to claim line honours and victory in corrected time ahead of Gerard Logel's Arobas and the 18.5m Wallyño. The Maxi Racing/Cruising division was dominated by Sir Irvine Laidlaw's Highland Fling which now sits in first place ahead of the Swan 90 Odin. Tomorrow, the forecast is for 8-10 knots northerlies, windward-leeward courses set for the Mini Maxi, Wally and J-Class divisions while the Supermaxi, Maxi and Mini Maxi Racing/Cruising divisions will complete another coastal course.